Consul General Dr. Sun Dali met Councillor Eddy Newman and wife at his residence on Nov.24, 2017 in the company of Deputy Consul General Fan Yingjie and Consul Lyu Xiaomei. They both reflected on the great leap-forward in the communication and cooperation between China and Manchester since Chinese President Xi Jinping’s visit to Manchester in 2015. Dr. Sun pointed out that the exchange of high-level visits gives a great boost to bilateral relations, business cooperation and sub-national cooperation. He calls for more attention paid to incoming Chinese delegations to further promote exchanges and collaboration in science and research, media, sports, publishing and education. 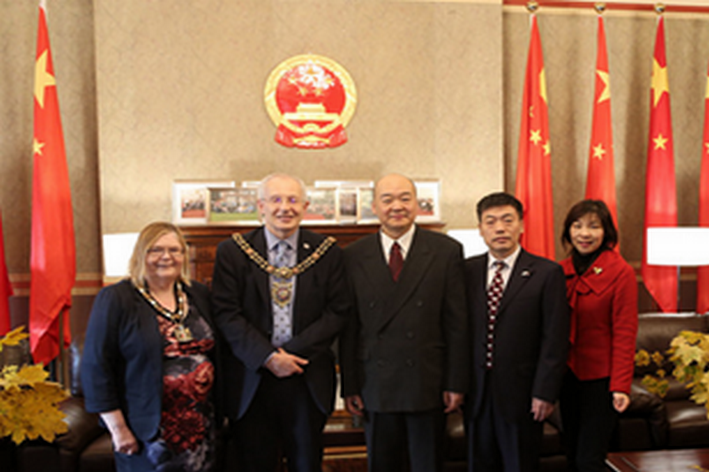 Councillor Newman noted the high percentage of visiting Chinese delegations he has received during his year of post and expressed wishes for broader and in-depth cooperation between China and Manchester amidst a continuous growing bilateral relations.